Ongoing and chronic migraines, tension-type headaches, and face, jaw, and neck area pain could all be inter-connected. What many medical professionals have come to believe is that unbalanced forces in your mouth affect the muscles of these areas, leading to changes in the chemical and nerve reactions that cause chronic pain. Dentists, including Dr. McNeil, have clinically proven devices derived from sports medicine that are used to assess, evaluate, treat, and relieve head pain. The treatment is effective for patients suffering from the painful symptoms of chronic headaches, migraines, TMJ/TMD, and many other painful conditions. A computerized measurement of the force balance in your mouth on a tooth-by-tooth basis. A computerized measurement of the disability of your muscle movements. With easy and painless tests, your dentist can see what’s causing your headache symptoms. 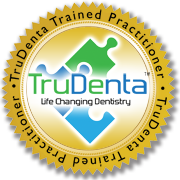 The remainder of your comprehensive examination helps you and your dentist pinpoint other related areas of mouth health, muscle health, tooth-related issues, and other potential problem areas that will be treated during your TruDenta therapy.